Do you have increased susceptibility to colds and other viral infections? Do you have dry, brittle skin or dry hair? Do you have low body temperature? Are you gaining weight no matter what you do to lose it? With over two hundred varying symptoms, thyroid disease is often an undetected, underdiagnosed, and undertreated disease leaving countless sufferers unhappy and unhealthy. Thyroid disease is linked to heart disease, dementia, diabetes, obesity, brain fog, cancer, joint pain, fibromyalgia and other health concerns. Some people may live for decades without being diagnosed or optimally treated, and unfortunately 80 percent of those are women. Get to diagnosis in days instead of decades. The demand for answers is urgent as thyroid disease has reached epidemic proportions. Dr. Janet is a survivor of Hashimoto's thyroiditis and thyroid cancer. In this book she passionately shares her experience and vast knowledge to help the millions of people who are suffering with undiagnosed ailments. This honest and engaging book will help the frustrated reader finally get to the root of their mysterious suffering to enjoy a healthy life again. 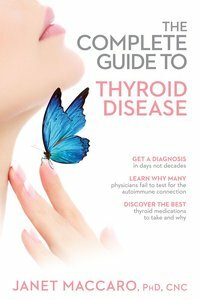 About "Dr. Janet's Guide to Thyroid Health"
Janet Maccaro, PhD, CNC, is a respected lecturer, author and radio/television personality. She has doctorates in nutrition and natural healing and is also a leading expert in natural progesterone supplementation. She is internationally recognized for her knowledge in women's health. Maccaro is a member of the American Association of Nutritional Consultants, the American Association of Pharmaceutical Scientists, and the Advanced Writers and Speakers Association. Dr. Maccaro has written three other books: Breaking the Grip of Dangerous Emotions, Natural Health Remedies and Midlife Meltdown.